I am sharing a delightful collection of 10 Free Mermaid Clip Art Images! Mermaid images are hard to come by, particularly those that are done in full color. There is something for everyone in this assortment – fun, whimsical, and seriously beautiful mermaid pictures. The detail of the artwork is just amazing. 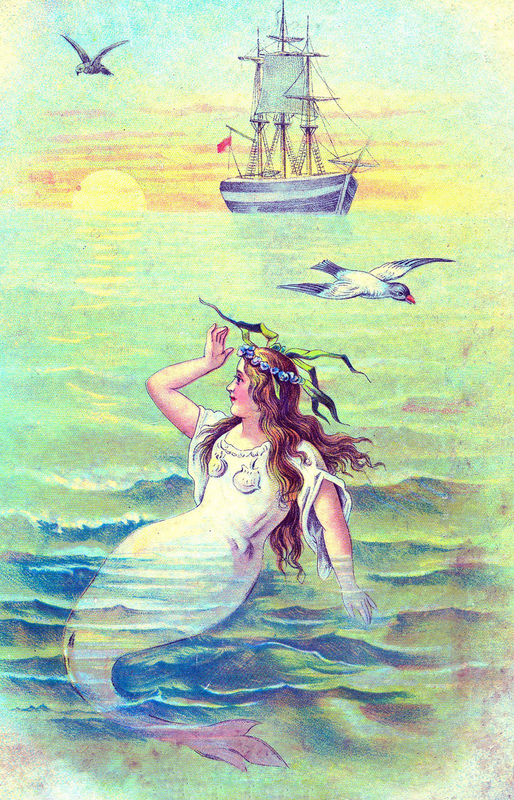 We have postcards, trade cards, black and white clip art, and even a Victorian scrap Sea Hag mermaid. So nice to use in your Craft or Mixed Media Projects! I could also see a Mermaid themed Junk Journal created from these colorful graphics. 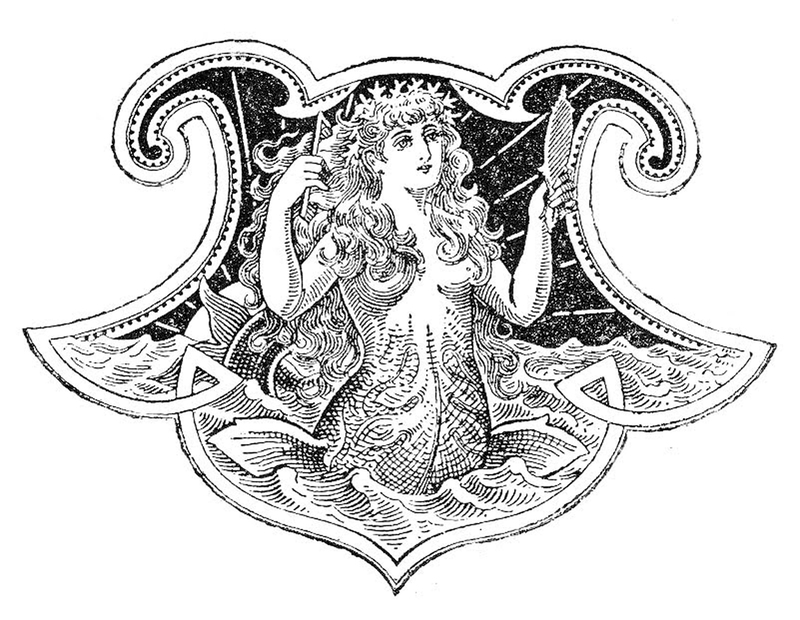 Oh how I love this beautiful vintage mermaid clip art! This little mermaid is wonderfully illustrated with long flowing hair and a crown of barnacles on her head! She is sitting on lovely stone steps with a carved balustrade. Her head rests in her hands, which are folded by her cheek. This gives her a wistful look gazing out to sea. Lovely. 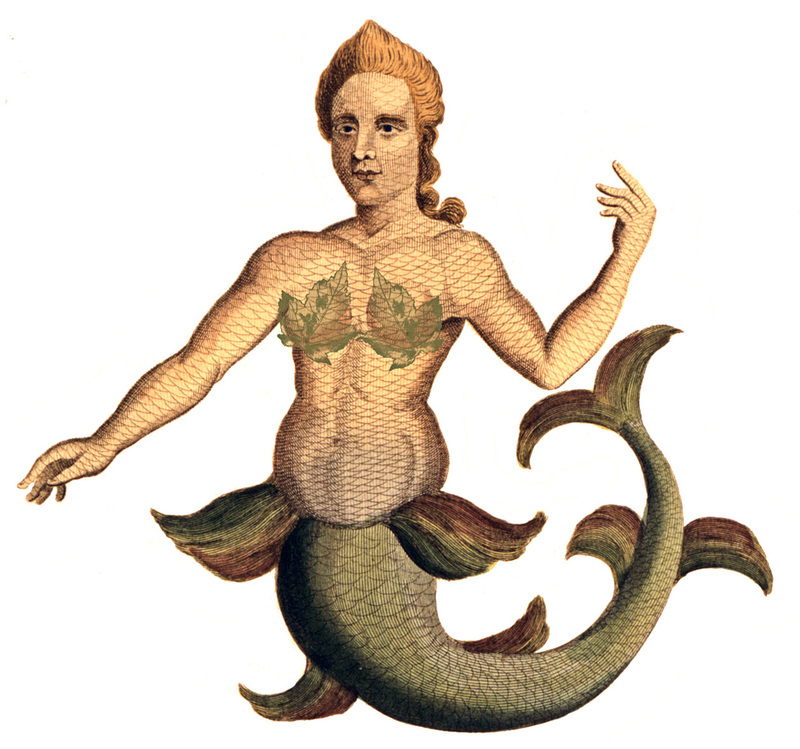 This is a fabulous Old World Mermaid from an Antique Design book! I just love the beautiful Acanthus Leaves used in her Tail. Her flowing hair is so pretty. She is holding flower branch like a mirror. 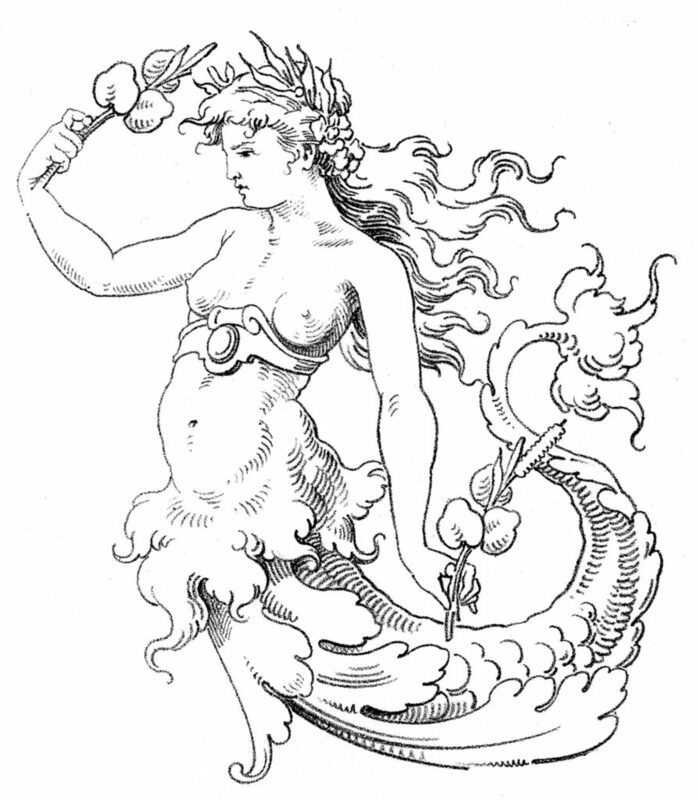 Above I’m posting this beautiful Mermaid from an antique book (circa 1880s)! This looks like a mermaid shield. She is combing her long flowing hair while looking in the mirror in her other hand. She wears a crown of coral. Her upper torso is emerging from acanthus leaves at the bottom of the shield. Good Mermaid images are hard to find so I was really excited to get this beautiful Mermaid advertising card! 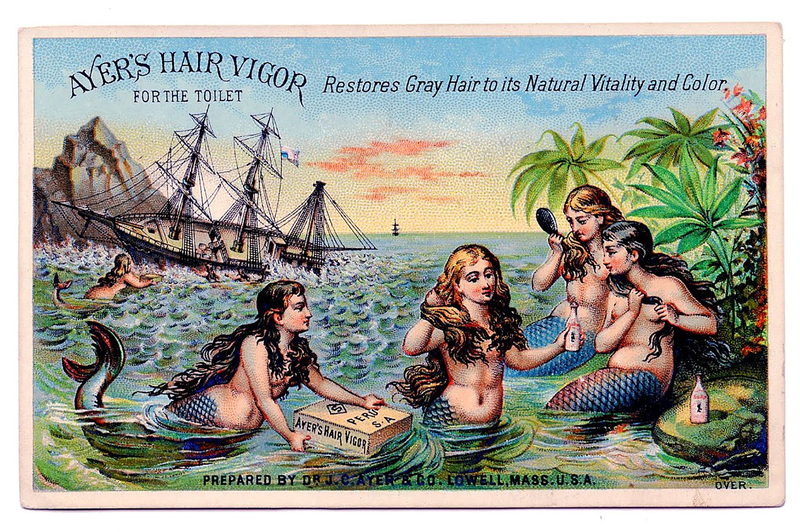 This card was made to advertise a Hair Tonic. It appears to be something along the lines of “Grecian formula” from what I gathered from the ad! I’ve included a second version, without the wording, so that you can use it for your projects. 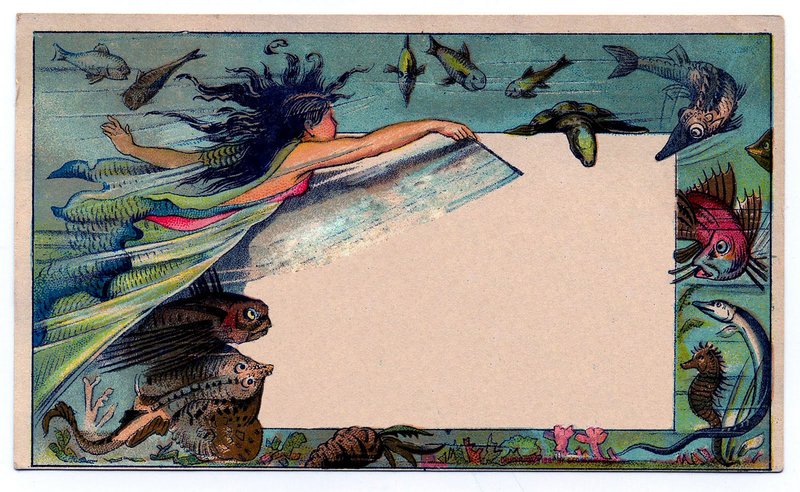 This wonderfully whimsical trade card features a gorgeous magical-looking Mermaid, surrounded by sea creatures of all sorts! 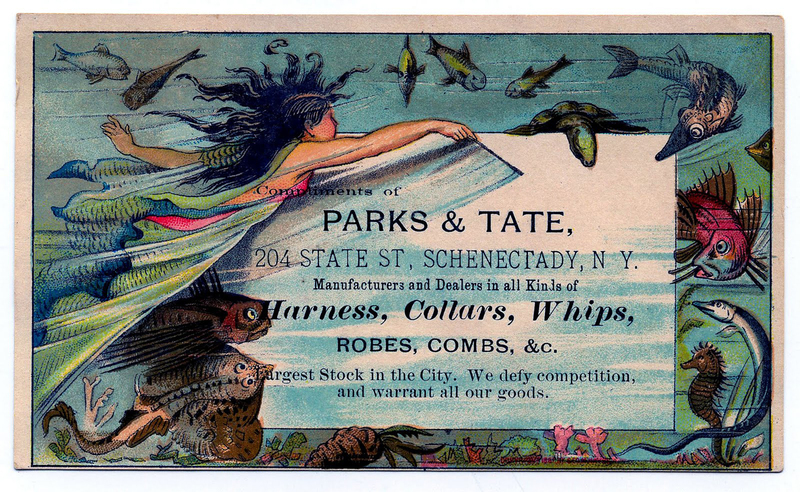 It is a trade card for horse riding accessories. I have also included a version without the wording. I was super excited to find this card on a recent antiquing trip!! This one comes from the cover of an antique children’s book. I hope you like it as much as I do! I was so pleased to come across this card in my travels to share with you. 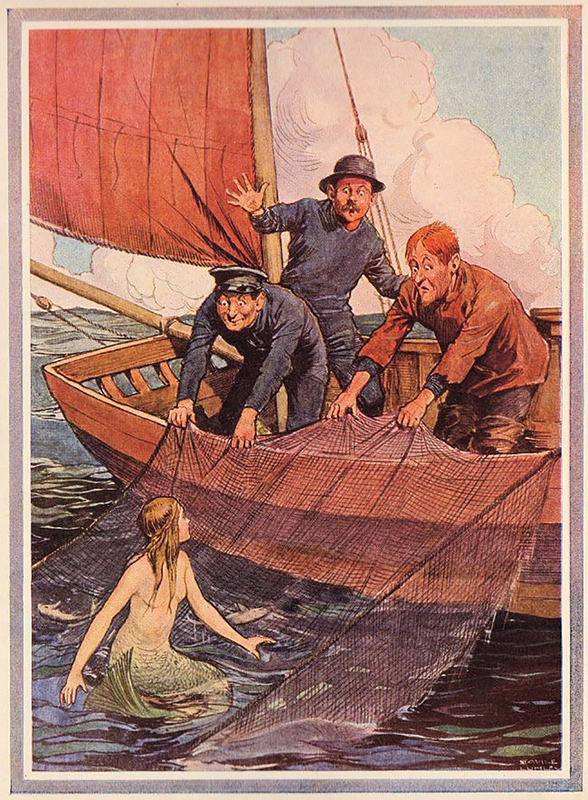 It shows this mermaid trapped in a net by the three surprised men in the sailboat. I hope you enjoy this beautiful mermaid clip art piece! 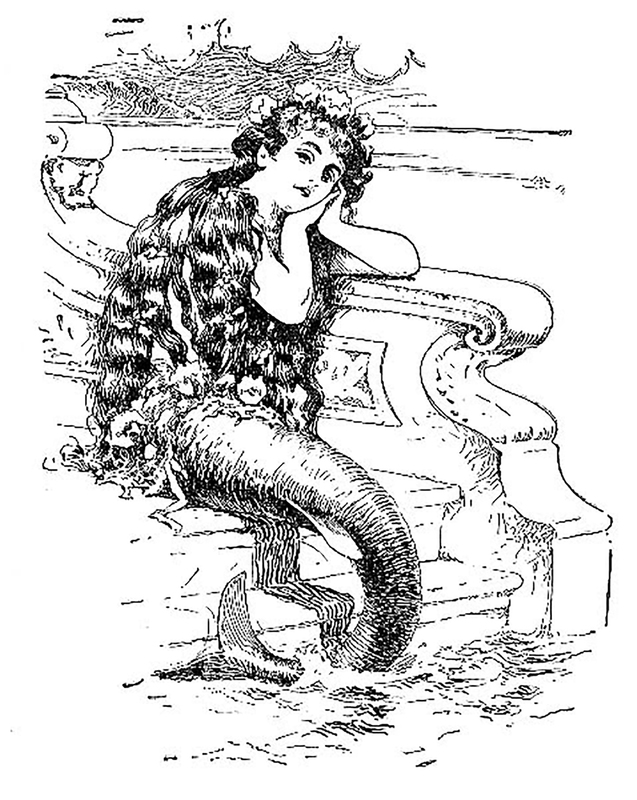 The final image in our mermaid clip art images collection is a Sea Hag. That is a term for an ugly Mermaid. I didn’t share her for a long time, because I thought she was too ugly. But she does have a certain charm. I hope you enjoyed this curated collection of 10 Free Mermaid Clip Art Images. You might also like our 10+ Best Free Vintage Fairy Images HERE .Or our 50 Best Ocean Themed Images HERE. Ocean Blues Ephemera Images Kit! Graphics Fairy Premium Membership 10 Anchor Clip Art Images! 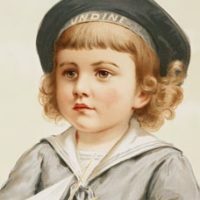 12 Vintage Sailor Boy Images in Color! « Forest Lore Junk Journal – Design Team Nik the Booksmith! Love mermaids and this one is great. I love the ship in the background… thanks! I was so happy to see the beautiful antique mermaid today. I will use them on art for my guest bath. Thank you again, Karen. Your work is appreciated. Thank you for such a beautiful mermaid. I collect prints and vintage images of mermaids, so anytime you come across one, please keep us in mind. I can’t heap enough praise on you for your fantastic blog! You are the Queen of vintage images! this is so lovely Karen, and the colours are great – thanks! Hi Karen, Thank you so much for all the great graphics you share. I was wondering if you have something to conmemorate Independence of Mexico, today we are celebrating that, Thanks again and have a great day! That is a beautiful mermaid and the water is a lovely color too! What a wonderful find this was! Thank you so much for sharing. You have a wonderful collection. I have downloaded this mermaid to blend it with one of my artworks and to create this way a new design for my Zazzle products. Thank you so much for these they are wonderful, the best yet. I am quite excited about being able to use them. Thanks Polly, I hope you enjoy them, have fun creating!